This issue’s article is a report we have been sent on James Glover’s tour of India from 7th to 22nd December 2002. This has been a huge success and is leading to renewed interest in, and expansion of, Vedic Mathematics. James Glover, one of the leading scholars and practitioners of Vedic mathematics, conducted a lecture tour of India in December. During his two-week visit he conducted thirty workshops and seminars covering five cities. Workshops were given to school and college students as well as to the public and everywhere the response was extremely positive. The whole tour was organised by Mr R.P.Jain of Motilal Banarsidass Publishers who is also the Vice-President of the newly established IRRFIH (International Research and Resource Foundation for Indian Heritage, incorporating the World Academy for Vedic Mathematics). For several weeks Mr Jain had worked tirelessly in setting up all the workshops and lectures and the great success of the tour is largely due to his fine efforts & many others who have equally jointly participated in making it a success. MUMBAI : The tour started in Mumbai on the 7th December with a 4 hour workshop at Tolani College of Commerce. The students were about seventeen years of age and really enjoyed the introductory session. They realised that there are many easy methods for calculation and algebra available for them to use in their studies. In the afternoon there was a Vedic maths book exhibition at the Motilal shop in Bombay where Mr Glover was interviewed by the Times of India. The large article from this appeared in the press the following weekend. aspects of cryptology and data transmission. HYDERABAD :From Bangalore James Glover went by overnight train to Hyderabad where he gave two large workshops. The first was at the Gujarati High School in the morning. Attending the workshop were about 500 students and fifty teachers. The second workshop was at the Hyderabad Public School with about 200 attending. This was a public event and there were far more adults. There was also some press coverage. Both workshops were a tremendous success with a large number of people wishing to follow up the subject. NAGPUR: The next three days were spent in Nagpur. His Holiness Sri Bharati Krishna Tirtha who first provided Vedic mathematics in its modern format lived at an Ashram in Nagpur during the 1950's. He established an organisation called Vishva Purnanirman Sangh. This has been kept going and is now flourishing with the establishment of a day-school for children. The school is called the BKVV (Bharati Krishna Vidya Veera) as is located on the same spot as the Ashram. James's next few workshops took place at the BKVV school where the teachers are all very keen to take up Vedic mathematics. He also met there with two of the remaining disciples of Bharati Krishna Tirtha. There is a lot of interest in Nagpur and this has been helped by the work of several experienced scholars of Vedic mathematics who are associated with the IRRFIH. Mr Glover had a useful and pleasant meeting with these scholars in Nagpur. NEW DELHI : Most of the second week was spent in Delhi where there were eight workshops at six schools. These again were very successful with all the students attending finding fun in mathematics as well as practical benefits. The two main workshops were at the India Habitat Centre. These were public and over five hundred people attended together with a TV crew from Dur Darshan, the Indian government channel. The first of these workshops was introduced by Dr L.M.Singhvi MP who used to be High Commissioner for India in the UK and who is the president of the IRRFIH. He gave a stirring speech as to the great benefits of Vedic mathematics and how everybody in India should take it up. Despite criticism & controversy of VM in the past he spoke of its origins and main characteristics together with some details of the research and development which has taken place. He described how it is that through R.P.Jain's alongwith his Co-workers' unceasing efforts there is now a new wave of interest in India. Dr Singhvi mentioned that he has spoken with the Prime Minister of India about the developments in Vedic mathematics and received a very favourable and positive response. Also in attendance at both the workshops was Prof.Hukum Singh who is head of mathematics at NCERT. Professor Singh is responsible for the whole of mathematics education in India. On Friday 20th December there was a meeting between Dr Joshi and Mr Glover together with directors from Motilal Publishers. Dr Joshi is the HRD Minister (Minister for Education and Science). He is most interested in the developments in Vedic mathematics and approves whole-heartedly of the introduction of Vedic mathematics into schools. It was explained to him that there are a few people in the UK who have long experience of implementing Vedic mathematics into the school curricula together with the provision of in-service teacher training and the supply of resource material. The expertise for organising such programmes is available. He suggested contacting the various state education departments separately together with NCERT and SCERT but he has already recommended the system. He gave much praise to the work of Motilal Banarsidass Publishers. All in all the lecture tour was a great success. It was also very timely because there appears to be a groundswell of interest in Vedic mathematics in the country of origin. This Academy has now been registered in India and is incorporated in the International Research and Resource Foundation whose Memorandum of Association and Rules and Regulations have now been formulated. The launch will take place some time this year, which is also the centenary of the formation of the publishers Motilal Banarsidass (who print the original “Vedic Mathematics” book). It is hoped that the Resource Foundation and Academy will be a huge help in furthering the cause of Vedic Mathematics and its existence is due mainly to the untiring efforts over many years of Mr Rajendra Jain to whom many thinks are due. Kolkata - 700 019 . There will be an introductory course in Holland on 25th, 26th January 2003. Cost : € 128,52 including the book "The Cosmic Computer"
Other courses/ talks are likely during the following week (27th Jan to 2nd Feb), so please see the Calendar at www.vedicmaths.org for news of these. Mr R P Jain has sent us this report favouring of the use of Vedic Mathematics in education in India. The allegation regarding imposition of Vedic Mathematics is equally wild & baseless. 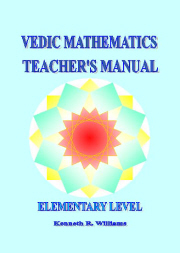 The 128 page NCFSE document mentions just one line about Vedic Mathematics - " The students may be encouraged to enhance their computational skill of Vedic Mathematics". It does not in any way suggest imposition of Vedic Mathematics. The biased & prejudiced minds who had distorted facts for ulterior political motives, now stand rejected by the Supreme Court. NOBEL LAUREATE Amartya Sen (NRI) took a leaf out of Human Resources Development Minister Murli Manohar Joshi's book when he extolled the glorious contributions made by Indian scientists since ancient times. He stressed the necessity of teaching Vedic Mathematics. Sen defended the need to study Vedic Mathematics, describing it as a means to understand & simplify complex mathematical problems. In response to an item in the last newsletter we have received the following. Aadarsha Vidya Mandirs are running in every important and unimportant places of Rajasthan including some in Ajmer, where teachers of VM are working and can be contacted. Devendra Bhatnagar is the incharge of VM teaching in all these schools. He can be contacted at Vidya Bharati Office of Rajasthan, Aadarsha Vidya Mandir Campus, Jaipur. -D P Verma, Prem Kunj, Kadam Kuan, Patna 800003. There seems to be a big interest in VM in Mumbai: here are three more contacts. A (growing) list of VM tutors can be seen at www.vedicmaths.org, under the ‘community’ tab. I am Hemantkumar Jain. (B.E. Production). I have been conducting Workshops on Mathematics in MUMBAI since the last 4 months and have trained more than 80 participants in Basic Skills of VM. The participants belonged to School level children, Engineering and Commerce Students, Housewives, Teaching Faculty, Working Proffessionals etc. To tell you about myself, I am working as Manager Operations in a company, but am very actively involved in conducting Vedic Mathematics Seminars and workshops (Mumbai) for some time now. Any person who wish to know more about it can contact me or my partner at 022- 527 8819, 022- 527 8821. An Electronics Engineer from Delhi University (1976) with over 23 years in the corporate sector has been teaching school leaving students who are preparing for admission to Engineering Colleges like IIT/DCE/NITs/RECs etc.